2017 we celebrate 25 years with the breed, and 22 years as Breeders of Chinese Crested! The owners of the kennel are I, Åsa Lagerstam, and my mother Tua Lagerstam. We have 12 dogs at home, 7 live with me and 5 live with my mother. All dogs live normal family lives, far from kennel houses, dogrooms and crates. We fell in love with the breed in 1992, and bought our first Crested 1993, and we are still "hopelessly in love with the breed". So this year we celebrate 23 years with Chinese Crested. We are a small home-based kennel, located in Skogaby, a small village; in between Laholm and Markaryd in Sweden (Åsa) and in Kungsäter, a small village; in between Borås and Varberg in Sweden (Tua). 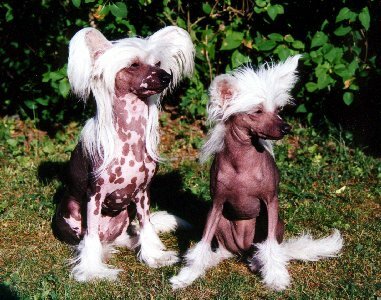 We are specializing in show-quality Chinese Crested Dogs. Our motto is quality not quantity, we produce a few litters each year. All our puppies are raised as familymembers, with lots of love and attention. We spend several hours a day with the puppies to insure proper socialization. We breed for excellent temperament, health and soundness and all of our breeding stock are sound of mind and body. Of course we ship dogs to other countries; we have exported puppies to top breeders in Asia and America. Take a look at our page Puppies for sale and planned litters. Feel free to contact us if you are interested in a puppy. On the picture above NORDUCh INTUCh NV-99 NV-00 Lionheart Kind Regards to Proud Pony (to the left) and JFINV-99 Proud Pony Heavenly Creature (to the right).